Adults overwinter in field edges near last year’s crop, with a small proportion remaining in the field. 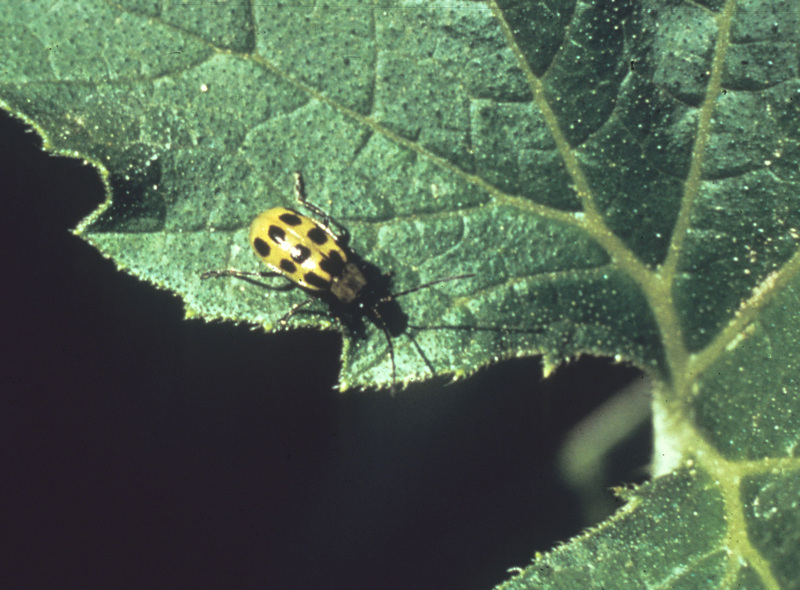 With the onset of warm days, beetles move rapidly into young crops. Adults cause direct feeding damage to cotyledons, leaves and the base of the stem. Eggs are laid in soil and larvae feed on roots. After the pupal stage is completed in the soil, summer adults emerge. These adult beetles congregate in flowers and may cause damage to fruit. Beetle feeding spreads bacterial wilt to young plants,especially before the 5-leaf stage. Cucumber and muskmelon are highly susceptible to wilt; watermelon is not. To prevent bacterial wilt in susceptible crops, scout for beetles twice weekly at the seedling stage. Treat when beetle numbers reach 1 beetle per 2 plants. Use crop rotation to reduce beetle numbers. Transplant crops instead of direct seeding to allow plants to reach a later growth stage before beetles arrive. Use a perimeter trap crop of Blue Hubbard or another Cucurbita maxima variety and treat borders with a systemic insecticide at planting or with a foliar insecticide as soon as the first beetles arrive, to protect a main crop of cucumbers and melons from beetle damage. Spunbonded row covers exclude beetles; use hoops to prevent abrasion and remove at flowering to allow pollination. Some repellents or systemics may be applied to transplants outside the greenhouse before setting in the field, which is convenient and allows lower rates of application.